You want reliability, comfort, courtesy, and safety when you call on any charter bus rental in DC. Whether it’s for a school trip, sightseeing adventure with family, a corporate event such as a conference, or even a church function, you know the value of quality when you see it. At Dulles Limo Service, we have dedicated ourselves to providing only the highest level of service to our clients for more than two decades. The moment you step aboard our DC charter bus, you will be surrounded by the details that make us one of the best charter bus companies throughout the country. The clean, well maintained buses, the luxurious, reclining seats, the video screens for convenient viewing, and all the other amenities that speak out to you about comfort and style will make you feel like the special person you are. Our drivers know exactly how to make your experience (and everyone on the charter with you) one to remember, for all the right reasons. They are highly knowledgeable about the area and make great tour guides. We’re willing and able to make last minute stops or even changes to your itinerary because we know you may discover something new at the last minute and wish to visit that location. We put all of our drivers through an intensive interview process before hiring them. Once hired, they go through regular training and safety evaluations. That helps us ensure your safety on every trip, along every mile. 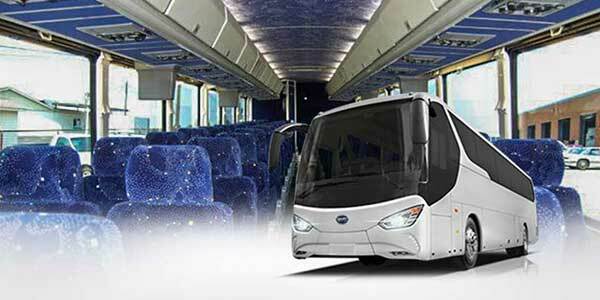 Our Washington DC Charter Bus also make sure we have only the latest model vehicles in our fleet. And each bus and limo goes through rigorous inspections to continue providing the safest transportation for everyone. Few other Washington, DC tours bus companies provide 24/7 customer support. In fact, few across the country go to this level of effort for their clients. And we’re proud of our commitment to making sure each. And every person who rides with us feels as though they’re being treated properly from the first minute to the moment they’re dropped off. We also provide immediate billing, can handle short notice availability, can transport 4,000 or more, or just a few people at a time, and equip all of our vehicles with the latest state of the art navigation and sound systems. There’s a reason why we’ve continued to grow through the years; when you offer people the best in luxury, comfort, safety, convenience, and knowledgeable drivers, it stands to reason that you end up as the best Washington DC Charter Bus Company.